It was born with an aerodynamic body and later transformed into spider, it ran several races with both bodies including three Mille Miglia. The chassis 39-2849 born as “berlina” on 28 April 1938 (engine 7586, gearbox 7712, differential 8069). In 1938 began appearing in Italian races the first Lancia Aprilia prepared according to the regulations of the National Sports category. The debut was that of Luigi Villoresi who won the Mille Miglia with a spider Zagato. Lorenzo Cantoni acquired this Lancia Aprilia in February 1939. At 6 Ore di Pescara appeared three cars, one was this aerodynamic berlinetta coach-built by Viotti and prepared by Pagani for Ambrosiana team. It was crewed by Cantoni - Agosti and was first in his class. In the mechanical workshop of Luigi Pagani in Piazza Castello 6 in Milan, at the same address of the Lancia Dealership Eugenio Minetti, were prepared many of the Aprilia Sport engines from late thirties. Pagani had in fact patented a special light alloy head in which there were two inlet ducts on both sides, by feeding the four cylinders with separate ducts and of equal length. The car with the aerodynamic shape of Viotti had a bonnet with two bosses to make room for two carburetors arranged on the two opposite sides of the engine. 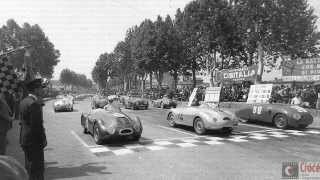 Transferred by the heirs of Cantoni to Agosti, he ran the Circuito dell’Impero 1939, the Mille Miglia of 1940 and the Circuito di Modena in 1946. This time the car ran with a new open body. At that time the car's mechanics was followed by Benelli of Pesaro and is believed also followed the transformation of the body. In 1947, the new owner, Enrico Adanti, presented it with a new livery and participated, paired with Spadoni, the Mille Miglia of 1948.